With so much depressing news dominating headlines these days, it’s nice to be able to celebrate the positive stories to counter-balance the negative. Bonus points for stories about badass women breaking barriers, as is the case with two women who have made history for World Wrestling Entertainment, Inc (WWE). Two women, one from Jordan, and another from India, have signed with the organization, making them the first female representatives from their regions. Kavita Devi is the first female Indian wrestler to sign with WWE, and Shadia Bseiso is the first woman from the Arab world to join the company. Both these women come from mostly-conservative countries so their presence in the WWE arena is also about breaking cultural taboos regarding gender. According to a Reuters news release, Shadia is a Jiu-Jitsu expert who wants to encourage more Arab women to get into the sport. “Female athletes are finally getting the credit they deserve. The world is more open to that, and in terms of how the region will react to it, I’m hoping its going to be very positive,” she said. Shadia told her parents about her new career path, and they were stunned. They did not try to stop her, but Shadia says they were worried for her physical safety. But as most people who are familiar with the WWE brand know, wrestling for the company is largely about entertainment. In an interview with The National, Shadia says the wave of female empowerment in the sporting world is an exciting thing to watch as well as be part of, especially as an Arab woman. “I feel like it is the perfect timing to have the first Arab female from the Middle East. The foundation has been laid with the amazing talent in the WWE that is already there…In the wider picture, you also credit the London Olympics where every participating country had to send to a (female) athlete. So as an Arab woman I got to see world class female athletes on the TV for the first time, competing at the highest level. I feel like if I had the opportunity to see that growing up, or if we had that growing up, maybe I would have been an athlete from the start,” she said. The Jordanian joined the WWE family after impressing the company in an invitation-only tryout back in April, along with 40 other athletes from the Middle East and India. “We did four days of back-to-back conditioning drills, indoors and outdoors, in Dubai. We got to learn in-ring drills, wrestling drills, and it was an incredible experience. So that was my tryout experience and after the tryouts, about a month after, I got the call saying ‘we want to hire you’,” she recalled. Shadia will now head to Orlando, Florida, for training and “character” development – essential for every popular WWE personality. 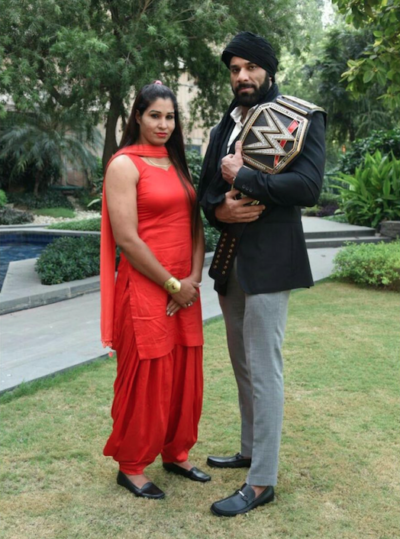 Kavita Devi may be the first Indian woman to join the WWE family, but she already has a fan in fellow Indian and champion male wrestler Jinder Mahal. He tweeted his congratulations to Kavita for making history. “I’m extremely proud to welcome Kavita to WWE where she now has a great opportunity to become India’s first female WWE Superstar. She is an inspiration to the youth of India and I wish nothing but success for her,” the “Modern Day Maharaja” told the press. It should be noted that Kavita is no stranger to stepping into the ring and taking on the competition. She is a professional powerlifter who won gold for India at the 2016 South Asian Games. She also previously wrestled on the independent circuit under the ring names Kavita and Hard KD, most notably for Continental Wrestling Entertainment. Kavita was a former Kabaddi player in high school who learned her ring skills from her mentor, former WWE World Heavyweight Champion The Great Khali (Dalip Singh Rana). “It was a privilege to be the first Indian woman to compete in WWE. Participating in the Mae Young Classic with some of the best female performers in the world was a great learning experience. Now I am looking forward to pursuing my dream of becoming the first WWE Women’s Champion from India,” she said, as reported by the Times of India. Kavita also credited her family for their support, something that is not commonly seen among conservative families in India who don’t support women pursuing anything beyond traditional gender expectations. “I achieved this position because of my family’s support. And I want to say that nothing is impossible for women to achieve,” she told ANI. Women wrestling has been in the spotlight in India as of late, due to the popular film ‘Dangal’, starring Aamir Khan as the father of two girls who taught them to become professional wrestlers, despite backlash from his community. It was based on a true story, and underscored the wave of female empowerment that is happening in India. There have also been a number of other women from India who are breaking barriers in wrestling, becoming inspirational role models for many other girls. Reuters reports that the decision to sign Shadia and Kavita is due to the growing fan base in the Arab and South Asian world. And now they will get to champion contenders from their own region. “Recruiting Kavita and Shadia to join our developmental system underscores WWE’s ongoing commitment to building a talent roster as diverse as our fan base. We’re confident Kavita and Shadia will inspire future WWE superstars,” said Paul “Triple H” Levesque, WWE Executive Vice President and himself a popular wrestler. “As it is, the WWE’s incredibly popular in the Middle East, but I think having athletes from the region who grew up here – it will change things. You finally have someone to root for,” said Shadia. Although she cites Jon Cena as one of the people she’d love to come face-to-face with in the ring, the majority of WWE wrestlers she admires and can’t wait to work with are the women – the Bella twins, Bianca Belair and the Iconic Duo (Billie Kay and Peyton Royce). It won’t be long before Shadia Bseiso becomes the name other Arab women cite if they are inspired to join the sport from seeing her in the ring. “I am absolutely honored to be the first Arab female from the Middle East to be signed to the WWE. It is a honor but also a big responsibility because you want the region to be proud. I need to work very hard as an athlete and learn and perfect the art to do the region proud,” she said. You can watch Shadia and Kavita in action in the videos below to get a sneak preview of what to expect when they step into the WWE ring for the first time.